Serves 10 to 12 This soft, moist, towering cloud of a dessert lies somewhere between a cake and a trifle, its lemon syrup–soaked cake layers alternating with lemon mascarpone cream. 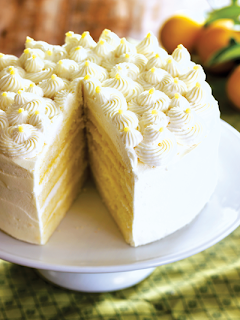 Meyer lemons are especially fragrant, but this cake is outstanding even with supermarket Eureka lemons. There are a few steps here, but almost everything can be done ahead, which makes putting it together pretty easy. 1 Preheat the oven to 375°F. Position oven racks in the lower and upper thirds of the oven. 2 Make the sponge cakes: Place the egg yolks and 7 tablespoons of the sugar in the bowl of a stand mixer fitted with the whisk attachment and whip on high speed until the mixture is thick and very light in color, 4 to 5 minutes. Set aside while you whip the egg whites. 3 In a clean bowl with a clean whisk attachment, whip the egg whites on medium speed to soft peaks. With the mixer running, gradually add the remaining 7 tablespoons of sugar and continue beating until the egg whites hold firm peaks. Fold one-third of the egg whites into the beaten yolks, then sift half of the flour over the top and gently fold it in. Repeat. Fold in the last of the egg whites until no streaks of white remain. 4 Divide the batter evenly between the prepared pans and bake for 18 to 22 minutes, until the top is golden, firm to the touch, and a toothpick inserted into the center comes out free of crumbs. Remove from the oven and place on a rack to cool completely. 5 Make the lemon syrup: Place the sugar and water in a small saucepan and heat, stirring occasionally, until the sugar has completely dissolved and the liquid is clear. Remove from the heat and cool completely. Stir in the lemon juice. 6 Make the mascarpone filling: Place the cream and sugar in a bowl and whip to soft peaks. Refrigerate. Place the mascarpone and one cup of the lemon curd in a bowl and stir until blended—it should be the consistency of pudding. Gently fold in the whipped cream until the mixture is homogenous and thick. If the mixture becomes overworked, it will look grainy or separated. If this happens, stir in several tablespoons of cream with a rubber spatula—stir just until the mixture has smoothed out again.